I recently had a chance to once again visit the Grand Army of the Republic Civil War cemetery on Seattle’s Capitol Hill. Comprised of survivors from both the Union and the Confederacy occupants of the GAR made their way to Seattle. Many died in the early to mid 1920’s. The visit was made with friends of mine, a couple I will call Jim and Maria to protect their privacy. Jim is also a mental medium. Maria is intrigued by what her husband picks up but doesn’t consider herself psychic. Normally when two or more mediums investigate a location at the same time key facts tend to match but each medium often gets different pieces of the puzzle. What was interesting to me is that Jim and I repeatedly got identical information. First time I have had that happen. I could tell from how the information was coming in that I was getting it from the occupants of the graves, not from reading Jim’s mind. Last time was more a group exercise with the ghosts of dozens of Civil War soldiers grouping around me and the friend I was exploring with at the time. This experience was a lot more personalized with a number of conversations with individuals in spirit depending on what tomb stone I was focused on at any given time. The most entertaining ghost of the evening was Jacob Davidson, a Private, Company E 2, and Michigan Infantry. He died January 23, 1896 a good 20 years earlier than his companions in arms. His birth date was not on his stone but he appeared to be in his 40’s when he enlisted. Jacob chose to manifest wearing an exceptionally nice custom tailored suit. He sported a full head of graying hair and white mutton-chop side burns. He wore round glasses, but only when he had to. I asked Jacob why he joined the Union in middle age. He told me he was so enraged by the events at Harper’s Ferry; he felt the need to join up. I pulled out my cell phone to quickly check up on Harper’s Ferry to make sure I remembered correctly that it was the location of John Brown’s short lived slave revolt. Jacob asked me why I was staring into the mirror (smart phone) in my hand! Jim and Maria explained to Jacob that it was form of electronics. Jacob understood electricity for light and heat but computers were not a concept he was able to understand. Jacob said he was in merchant banking before the war. He left his wife and three children when he enlisted. At the time of the Civil War he had a son a daughter and a baby boy at home. Sadly he told me his wife died the first year of the war in 1861. After the war Jacob remarried, had a few more children and moved to Seattle with his blended family. By that time his first-born daughter was married with a young child of her own. The entire Davidson family moved and thanks to Jacob’s prior business successes were able to buy a home in Seattle’s Magnolia neighborhood right away. After the war in Seattle Jacob said he made his living in “trade”. He showed me he spent a lot of time at the bustling docks of the Port of Seattle. Jacob remained a man of his time. I was amused when he told me that any woman of his era that had shown as much leg as I did in my walking shorts “…would have been horse-whipped.” I was told in no uncertain terms his daughters would have never sworn like a sailor as I did. I agreed, but pointed out his daughters didn’t live in 2015. I do. Maria had me ask Jacob if Bruce Lee (buried in the cemetery across the street from the GAR) ever visited? Jacob may have been anti-slavery in the 1860’s but didn’t view all ethnic groups equally. In short he indicated Lee’s shade would not be welcome at the Civil War graveyard. Maria wanted to know if Jacob had much interaction with Asians in his lifetime. Jacob mentioned Chinese workers brought in to build and finish railroads in the Seattle area. He was annoyed with me because I would casually swear in conversation but wouldn’t repeat his racial slurs. I told him my occasional profanity was considered much less offensive in 2015 than his slurs. Suffice to say we didn’t convince each other. At one point Jacob asked me to step aside from the conversation as he wanted to talk to Jim. Since you always get more ghosts with honey than vinegar I obliged, stepped back and chatted with Maria for a few minutes. A similar request was made by the occupant of one of the six “unknown” graves in the GAR. Jim had gone to the car to get a jacket as the heat of the day was fading fast in the waning light. “Thomas” or “T” as he said he was called informed me he would not say another word until Jim returned. He wanted to talk to a man, not a woman. Fortunately T decided to talk to both Jim and I when Jim returned. Thomas came across as quite the con artist. He fought for the Union but used the war as an opportunity to abandon his wife and children. At some point during the war he met and hooked up a black former slave woman who became his common law wife in Seattle. They had two sons and a daughter together. Because he didn’t want his first family to find him Thomas kept all his identity and enlistment papers in a small wooden box with a sliding lid. It was about the size of a modern shoe box but Thomas insisted it originally held blueberry preserves. Thomas died of diphtheria in Seattle. He was carefully nursed by his second family. He left instructions that upon his death his second wife was to burn the box with his documents in it. Much to his frustration, she didn’t do so. Instead, according to Thomas she was proud to have landed a white man as a husband and eventually donated his box of identification papers to a museum. At this point Thomas asked Jim to find those papers, break into the museum and finally destroy his documents. Jim flatly refused and pointed out to Thomas that in this day and age Jim could spend life in prison for stealing artifacts from a museum. Thomas protested they were his documents he should decide what happened to them. He was not happy with me when I told him as soon as he died he lost all control of his papers. It was unfortunate his wife had not honored his wishes but nothing could be done now. Thomas’s raspberry response translated perfectly across a century and a half. Both Jim and I felt Thomas was the slippery sort of man who would sell you the Brooklyn Bridge if you would have paid for it. Thomas said he did have a several times great-grandson alive in the Seattle area but that the man had no idea of his connection to Thomas. Not surprising as Thomas is in a grave marked unknown. I talked to three of the six unknown grave occupants. One late soldier a few stones down from Thomas was not in the mood to chat. He told me to go away as he wanted to go back to sleep. I respected his wishes. 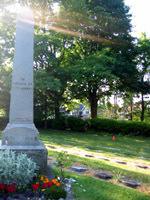 The final unknown grave contained another Union soldier. This young man had lied about his age to enlist. I didn’t get a name but he was just a kid, a teenager whose government issued uniform hung on him like a scarecrow. He was a skinny, lanky kid who enlisted to make his father proud. As the sun started to set a real-life volunteer arrived to take down the flag. I dusted off my rusty Campfire skills and helped him properly fold the flag. In return he showed us the graves of Edward T. Clarke, a member of a black regiment who enlisted at age 21 and lived until 1932! Edward was not inclined to chat much but when asked how he lived into his 90’s wryly answered, “By eating collard greens.” Maria and I had to explain to Jim what collard greens were, noting they remain a popular Southern dish today. The flag volunteer also pointed out the grave of Frank Bios, a Medal of Honor recipient who served as a Quarter Master in the US Navy on the USS Cincinnati. Serving in the Navy in the US Civil War had to be grueling. Not only did Frank survive he lived to age 81. Maria, Jim and I were clustered around Frank’s grave and the woman buried next to him took offence and told Jim to stop standing on her grave! He obligingly moved and she further commented that he looked like a boy. Jim found that funny as he is 50-something. Maybe his jeans and sweatshirt made him look younger to that ghost lady? Not too far from Edward Clarke’s grave was the only couples grave I noticed at the GAR before we lost daylight. It was the grave of Levi and Anna Wright. Interestingly Anna was three years older and survived Levi by 10 years, all the way to 1932! Jim and I asked Levi if he was in the Civil War. He said he was, but not as a soldier, rather as a doctor. Levi made a play on words. In the Middle Ages crude surgeons were called barber surgeons. Levi said he was a lot more of a barbarian than a surgeon in his field hospital work due to the endless limb amputations. Because of his name we asked Levi if he was Jewish. He confirmed he was. He said he worked for the Confederacy because they were not as picky about the background of those who served. Dr. Wright noted that when a man was screaming in agony due to a shredded limb he didn’t really care about the ethnicity of the doctor who treated him. Levi told us he was a boy when he and his parents and siblings immigrated to the US from somewhere in Europe. Anna’s parents immigrated but she was born in the US. Levi said his family first settled in a Mississippi river town and he met Anna because she lived the next town over. Despite Levi’s version of events he is listed as having come out of Ohio on the GAR bulletin board registry. Maria, Jim and I speculated that perhaps the Wright family lived in Ohio by the time of the Civil War. I felt pretty solid about Mississippi as Jim got the same state independently of me. As an added bonus Levi’s wife Anna was also willing to chat with us. She was a plump, short woman with black hair pulled back into a bun. Her doctor husband provided a good living for her and their six children. She said they had four boys and two girls. She showed me herself getting the Sabbath table ready with a snowy white table-cloth, a deep red table runner and crystal wine glasses. Jim asked if she used candles on the table. She confirmed she used standard tapers for the Sabbath table. Confirmation from the dead person you are talking to is a great help when learning to trust your abilities as Jim is now. Overall Anna Wright seemed to be a gracious and kind lady. Apparently Levi and Anna Wright still have descendants in the Greater Seattle area who know about them. One of the benefits of poking around a ghost dense location such as the GAR with another medium is what I call the catalyst effect. Any time you get two or more psychics in close proximity (such as the same room) each amplifies the abilities of the other. In too many cases with talent in mediumship comes matching egos. Working with Jim was great because neither one of us were worried about outshining the other. When you don’t see someone with the same skill set as competition marvelous collaborations are possible. I am sure we enjoyed so many detailed conversations with the residents of the GAR because of an ego free catalyst effect. Thanks Jim and Maria… looking forward to our next adventure! This entry was posted in Personal Blog and tagged Civil War ghosts, Grand Army of the Republic, haunted seattle, Lynne Olson medium, Lynne Olson psychic, Lynne Sutherland Olson. Bookmark the permalink.